Provide comfort for the family of Annabelle Moore with a meaningful gesture of sympathy. 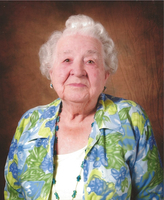 Moore, Annabelle Frances (Wilcox) peacefully passed away at Bonnechere Manor on Sunday, January 20th, 2019 in her 96th year with her family by her side. Beloved wife of the late Harold Moore. Loving mother of Murray (Marie), Donald, Dianne Lyons and Darrel (Judy). She was predeceased by her son Graydon, his wife Shirley and their daughter Pamela Moore as well as Annabelle's brother Lester. Grandmother of 11 grandchildren, 17 great-grandchildren, 4 great-great grandchildren, 2 step grandchildren as well as 2 step great-grandchildren. Annabelle is survived by her sister Merney MacDonald. Visitation will be held at Zohr Family Funeral Home, Eganville, on Thursday, January 24, 2019 from 10am until the time of service in the chapel at 11:30am. Spring interment Melville United Cemetery. Donations are being accepted for: EGANVILLE AND AREA LONG TERM CARE CORPORATION. We encourage you to share your most beloved memories of Annabelle here, so that the family and other loved ones can always see it. You can upload cherished photographs, or share your favorite stories, and can even comment on those shared by others. Provide comfort for the family of Annabelle Frances Moore by sending flowers. To remember, Annabelle, a good friend.